The accommodation was convenient and close to the train station. Excellent apartment. Great location for the county court, which is where I was working. Spacious apartment for a very good price. Clean and comfortable. Lovely views over the river. Located in Cardiff City Centre, this apartment building is steps from Cardiff Market and Principality Stadium. Friendly owner, very helpful. Clean and nicely decorated room. Good location but there is no parking, however I was kindly helped with that. Would stay again but probably in one of the bigger rooms. Lovely property in the heart of the city. Would return. Lovely spacious rooms, very clean, great facilities available in the room (washing machine and dryer), on a beautiful street close to several restaurants and a corner shop, only a few minutes from the heart of Cardiff. We were greeted by Andrew the property owner who gave us a lovely welcome pack including bubbles and chocolates which was a super start to our wedding anniversary celebration weekend. 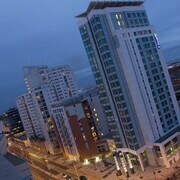 The penthouse was of the highest standard with superb views over the bay. 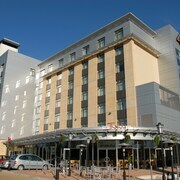 Radisson is well located between the city center and the Bay and has all the amenities needed for a traveler. Breakfast is brilliant, actually better than in a five-star hotel I stayed at a couple days later. The only problem was bad cleaning of the room on arrival. We were a party of three ladies and what I was afraid of, did happen. Toiletries, towels, robes, glasses, teabags etc., were short. My assumption would be that housekeeping would have a record of how many people are in the room.